"No travel comfort or customer service"
❎ Unverified | Completely nonsense with the international departure. I have travelled to so many places and no airport is like this. When you check in, they require you to scan all your bags, not just the luggage but all the bags. Then when you get into the international departure, there is nothing. They won't even let you into the departure hall where all the food and drinks are because that's for domestic until you get through the gates. You have to wait until closer to flight time for the gates to open. No travel comfort or customer service at all. This is worse than the airport in underdeveloped countries like Vietnam or Cambodia. Their airports are better by a mile. Malaysia airports overall need a serious rehaul. Maybe go learn from Singapore their neighbor who got Changi Airport right. "clean facilities and adequate staffing"
✅ Verified Review | A small and modern international airport with clean facilities and adequate staffing. There are reasonable shopping options, KFC and Starbucks until you go through passport control. If you are on a domestic flight the options look good. However on the international departure side you are in a deserted shiny new hallway with no chairs. A major negative. This leaves you wishing you had waited on the other side. Free WiFi works, slowly. Airport is quite small and toilets are not so clean. Not much to do while waiting for your flight but for a short wait the experience is not that bad. I have travelled through Kuching many times in the past (even before the current new terminal) although this was the first time in 3 years. The airport has become very grubby especially the general waiting areas post immigration/bag x-ray. The toilets were in an appalling state. The air conditioning is set far too cold (even for a westerner). My Malaysian wife also noted that the airport had deteriorated since she last passed through. Not a good advert for tourist arrivals into Kuching! 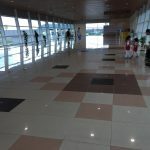 Having gone through so many different airports around the world Kuching Airport is definitely one of the better airports to use. Airport workers here (check-in counters security immigration etc.) are generally fine but can be improved especially on the level of professionalism in their communication with passengers. 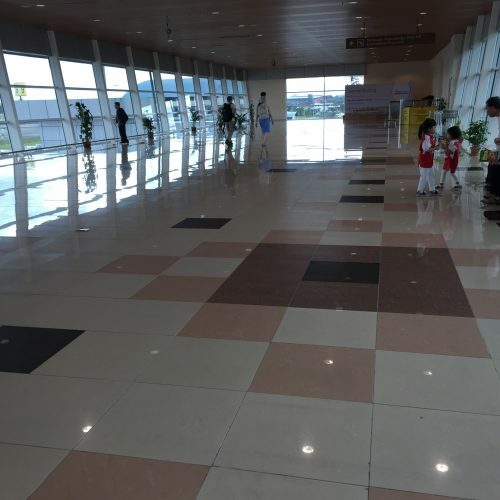 The airport may look very new but there is a need to improve some facilities such as seating areas especially the terminal Air Asia uses at one end of the single terminal and the automated passport gates at the arrival hall. Cleanliness can be improved as well particularly on the toilets. 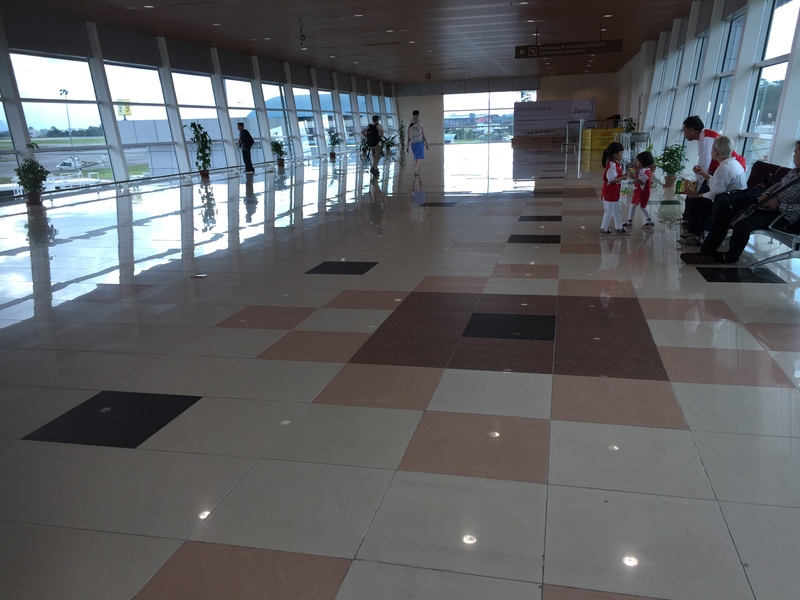 Overall Kuching Airport is a good and hassle-free airport to use. All staff were friendly. Fair enough its a medium sized regional Airport serving a city of 500000 and a vast state of 2.9 Million people so comparisons with massive megahubs are not really fair. But for a small regional Airport this works. Better food outlets on the flight side perhaps. A bit more variety would be nice. Food outlets were okay if you are fine with fast food - MacDonalds KFC or Starbucks. Shopping overpriced so don't bother. Luggage need to scan before check in so you need to arrive early. Setback no complimentary internet access unlike KLIA which has. Kuching Airport has definitely shown a great improvement as compared to 5 years ago when I went to for my holiday. It is much better as it has more dining places and restaurants such as McDonalds KFC Starbucks etc in the airport. International flights are still rather limited due to government policies. Fully air-conditioned all Kuching Airport needs is ground staff that speaks fluent English better services more airlines and flights. The airport has come on leaps and bounds in recent years with excellent development - but it seems to have gone a spot too far. It's never the busiest airport and is now attempting to drive people to electronic log in at a number of terminals by departures. Whilst quick they are let down by the slowest "fast bag drop" I have ever seen and notable was a tendency to try to charge for excess baggage. It really appears quicker and cheaper to check in the traditional way.